The Grapes of Wrath Is About My People – The Bookshelf of Emily J.
I have ancestors—my great grandmother, Alabama Gray (she preferred to be called Bonnie), in fact—who traveled from Oklahoma to California between 1910 and 1920, just before the dust bowl and depression were pushing people from the mid-west to the west in search of work. I have known this for some time now, and recently, in conducting family history work, I realized that as a young woman she worked at a cannery. The man she eventually married, Rufus Morgan January, who during his younger years traveled from Texas to California, alone, presumably, and began boarding with friends. His occupation in the 1930s is picker and cannery worker. They lived in Lindsay, Tulare, California, the very place that John Steinbeck’s The Grapes of Wrath (1939) suggests there is work for the Joad family. My great grandparents were among the “Okies” that Steinbeck so realistically and sympathetically portrays in The Grapes of Wrath. My favorite sections of the book, prose-wise, are the interludes that attempt to describe the overarching or nameless faces of that time in the United States. There are car salesmen, gas station owners, and the land, all speaking from a place of realism and pain and self-interest. The book gets at that self-interest, especially when the Joad family arrives in California, a place they have built up in their minds to be paradisiacal, and discover they are not wanted, they are hated, there is no work, and that there are already too many Okies competing for food, work, water, shelter, and peace. It highlights the tragedy of that age, the desperation of poverty, and the ugliness of human nature. The sheriffs and residents would drive the travelers as if they were cattle or vermin. They would kill and attack with no provocation other than prejudice and hate. I think we see similar sentiments today, and in every era, when people who are different from us come looking for the same opportunities and privileges we have. I can’t help but be drawn to Casey, the preacher. He’s an admitted sinner and a quitter when it comes to preaching, but he is also a heroic figure who ends up becoming a sacrificial lamb for the cause of the families looking for work and relief. He protects Tom from the law, going to jail for the crime. He pays for Tom’s deed. He gets out of jail, claims that he finally “sees,” and works to lead a union fight against unfair wages. He says he has a knowledge of what is really important and he fights for that. He dies for it. He’s truly heroic, in the traditional sense of the word. (See my post on Harry Potter for more about the hero cycle). I couldn’t help crying when Ma feeds the starving children in one of the camps. She has their last stew, only enough for the large “fambly,” but she encourages the children to get flat sticks and scrape out the pot once she has served her people. She cannot watch them suffer and she cannot keep it from them. One of the mothers is angry about the charity, but Ma explains that she just couldn’t stand there and do nothing and watch them watch her. She knew they were starving. Tom is also an interesting figure. One of my favorite scenes is near the beginning when he gets out of jail for murder and has a tense conversation with a trucker who gives him a lift. It captured my attention and made me care about the rest of the book and the rest of the family. Tom throughout is seemingly calm and carefree, but he has a violent streak that constantly leads to trouble. He cannot control that part of himself, and in the end, with Casey’s sacrifice, he too “sees” and decides to try to make better and do better for the people. He becomes a leader. The end of the book is what is most powerful, shocking, and poignant. Rose of Sharon, the pregnant and abandoned-by-her-husband daughter of the Joads, gives birth to a stillborn. She has been worried throughout the pregnancy because of their hard travel, their lack of fresh food and milk, and the words of a crazy woman who tells her that she’s in trouble and the baby will be cursed for sin. Rose of Sharon is fragile and ill. She just wants milk during her pregnancy to make her unborn baby strong, but it is not to be. The baby is born dead. The baby is born in a downpour, and her parents must leave all of their possessions and their vehicle stuck in the mud to find shelter. They take Rose of Sharon and find a little shack. In that shack, a man is dying, and his young son is scared and alone. He explains that his father is starving to death, after having given him most of the food over the last week. Rose of Sharon, scared wet, alone, in shock, grieving the loss of her baby, and still in want of milk, offers her breast to the dying, starving man. She feeds him with the milk she has produced for her child, but that she cannot use herself. This scene echoes the idea throughout the book, that the poor are more generous than the rich. Many times the family receives kindness from other starving, struggling families or the poor men who work for the rich men. The poor take care of each other, yet they have, seemingly, nothing to give. This theme is instructive for many reasons, but for me, it causes me to ask, “What do I have to give?” Compared to most of the world, I have much and I am rich. I do not consider myself to be rich, not in an extravagant way. Although I sometimes feel I have nothing to give, this book proves otherwise. There is always something to give, and the poor sometimes know what that is more than those of us who have so much we have a hard time letting go of any of it. There is so much more to this book. I could mention the grandparents, who both die on the trip, and Ma’s sitting with “Granma” all night while she died and then sitting with the dead body until they can cross into California without telling anybody. I can mention the two children, Ruthie and Winfield, who are excited over the possibility of having a single box of Cracker Jack toward the end of the trip once the family has work. I can mention the children’s surprise over flushing toilets at the government camp and their worry that they had broken them. I can describe the delicious shower Ma took for the first time in months at that camp. I can describe Al’s conversation working on a car with a neighboring family. All of it is beautiful, in a gritty, shocking, and sand-papery way. 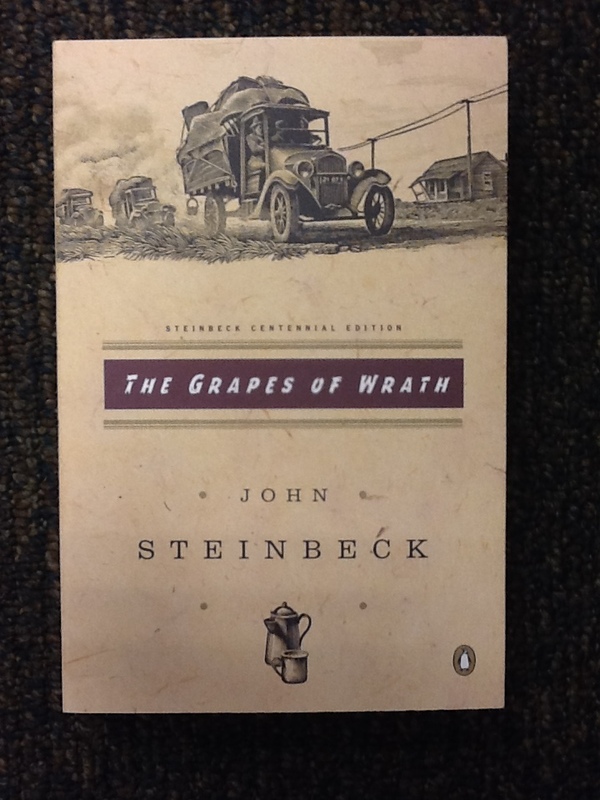 Steinbeck captures poverty, history, and continuing American sentiments in this novel. I now know why my mother urged me to read it and why it is required reading in many classrooms. I know why it is an American classic and one of the most famous of Steinbeck’s books. (It did win the National Book Award and Pulitzer Prize.) I also know why it is number 28 on the BBC book list, and I am glad it is. I would not have revisited it otherwise. I would have continued to claim that I had read it and been completely ignorant of its lessons, its significance, and its connection to my heritage and family. The Grapes of Wrath is about me, my people, and America. It is about all of us. Wow! I’ve seen the movie ages ago, but never read the book. 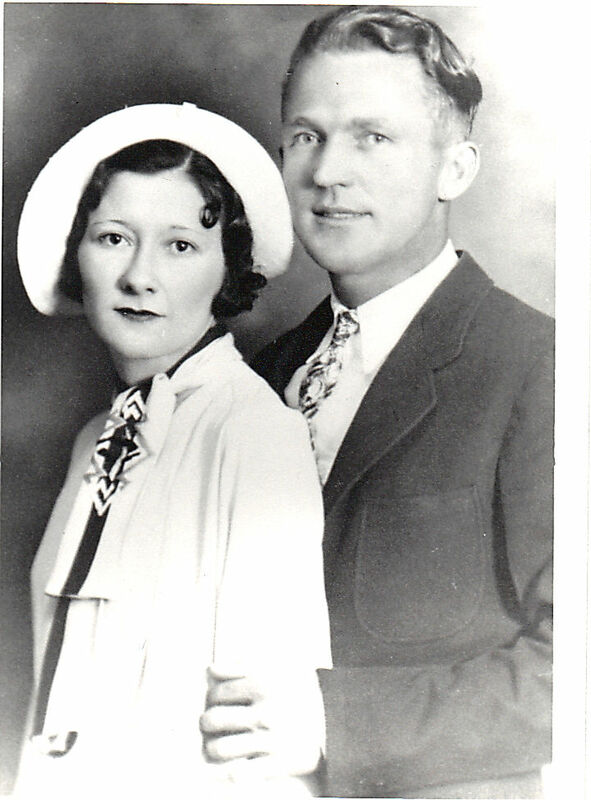 It’s amazing that your great-grandparents were so connected to the people in that novel. I bet it was like reading a personal history of what life might have been like for your great-grandparents. Yes, exactly! It was like getting a glimpse into what their lives really must have been like then. This is a thoughtful & thought provoking review. What a great way to start the morning; thanks. What a kind compliment! Thanks for reading today. Emily- what a wonderful review! I have not read The Grapes of Wrath yet, but after reading your post, I m putting it on my list-thanks! Definitely read it! Like I said, there is some tough language and tough issues, but so worth it in the end. Your representation and identification with this classic is awesome. I may need to read it again with this in mind. Powerful. I think I’ll have to move this book up my list. I also think I’ve read it before but since I can’t say what it’s about, perhaps I haven’t. Great review. How neat that this is about “your people.” I read “Sometimes A Great Notion” by Ken Kesey and found that it is about my people. I love how close books get to us, like family. What is the Kesey book about? Now I want to read it! It’s about logging families in Oregon, back when the industry was switching from manual & horse drawn work to machinery, and the beginnings of labor unions, and the ideas of progress & backwardness. It’s a feud tale but has some interesting twists and turns. It’s about poverty and burgeoning labor unions, and it’s about fitting into a town ethos, or rather, not fitting in and holding your own. Overall, because my family is steeped in Oregon & Washington timber industry from early on, I can see a lot of my own people in the individuals in this story, and how they stick together and how they fall apart from sticking together. It’s a really challenging book to read for several reasons, not least the style of writing, or the main character’s schizophrenic point of view, or it’s dark desperateness, but I found it ultimately rewarding. Actually, it’s really difficult to say why I liked it so completely, given that it sounds just awful. 🙂 Perhaps it’s the setting, the dark drippy mossy forests of Oregon’s coastal range, that are so vivid, you could step outside in November and be right there, in the story, but there’s just something to this story that really gets inside and makes a home. Ha! It does sound awful. But sometimes those dense, scattered books reap rewards in the end, more so than a straightforward one. I might just try it, but I won’t have the same connection you do. Thanks for telling me more about it. Emily did you know that your Grandparents on the Carmack side lived through the same thing? I really enjoyed your post on the Grapes of Wrath And I remember those camps in California I was really small but I remember the one room cabinsand the poor dirty people .We Didn’t stay there long we were able toget..t out and go to Watsonville where Mom& Dad worked picking apples.So the book really is about your people. Grandma! I had no idea. I should’ve looked at the family history records more closely. Now I want to have you tell me more about that time, especially since you remember it. Thanks for telling me! I will have to sit don and do some thinking and try to remember. It was much later than when the Joads were there. They had cleaned up a lot of the squaller .It had to be about 1940 no sure.I will talk to my brother h remembers more than I do. One of a handful of truly great pieces of American literature. So well done and so much truth about ourselves. Exactly. Well said. I can’t rave about this novel enough. Wonderful review. My heritage is also Cherokee Strip land rush, dust bowls, and Oklahoma. Thanks for reminding me of The Grapes of Wrath. It’s time to read it again with a new perspective. Thank you. I hope rereading it is enjoyable because of your connection. That’s so cool! Fantastic! It has been a long time since I read this book. Thanks so much for reminding me. This triggered memories of slavery and racism; it triggered thoughts of border prejudice where the people in one country have been taught to detest the ones across the border, when their genetic lineages probably go back to the same bloodlines. I was lucky to have read Grapes of Wrath after experiencing enough life to truly appreciate the lessons. Your review allowed me to reopen that book and review those pages again in my mind’s eye. Thank you for connecting me back to an old friend, one that continues to remind us to be humble and helpful and to have empathy for those who have less. BTG encourages us, in his post for today, to pay it forward. Thank you both. Ooh, that’s a good quote. That issue in the novel indeed reminded me of current border squabbles and the rhetoric surrounding some of that. Thanks for connecting my post and BTG’s. They certainly are the same theme with variations. All of this goes to show, for me, how timeless Steinbeck’s novel really is. Thanks for a great review! I haven’t read this one although I always mean to. I love East of Eden. I must make it a goal to read it this year! Yes, do! I know you’ll appreciate it. You have won me over! I have never, ever read Grapes of Wrath. I have heard wonderful things about it and now, I am absolutely certain that I must read it. Your beautiful review was wonderful to read. I love family history! Thank you! Yes, family history is fantastic fun! It makes me feel connected to something bigger than myself. I hope you like the book. It is a classic to be sure. It is a simple portrait, but beautiful. I think I have those feelings because they are “my people,” but all old photos have something special about them, in my opinion. John Steinbeck is definitely in my top three favourite authors of all time, his voice has such authenticity and is so evocative of the times he writes about. It is amazing that you discovered that family history, it makes reading about it far more relatable I’m sure. What a fantastic picture of your great grandparents, and what a fantastic picture on your copy of The Grapes of Wrath. It really did bring the story to life for me. I love Steinbeck, too! He is amazing. Such an insightful review ! I admire your reviews because you bring out so many nuances hidden in the story. I’ve often thought that the people of those days who had to face so much adversity were truly strong individuals. They came out of it and went on with life. Nowadays we love to cling on to our miseries and close ourselves to people around us. The more physical comforts we get, the more we seem to regress mentally. What a great observation. We do tend to cling to things for comfort, rather than people. We’d probably be happier if we consumed a little less and loved a lot more! Allow me to tell you some things about your Great Grandparents .The Januarys Grandma Bonnie was an elegant lady and so sweet and loving. I don’t remember her ever looking disheveled She came out of her bedroom in the morning ready for the dayShe worshiped your Grandpa and they called him Sonny Boy. Grandpa Jan was a little more laid back I remember him barefoot in his rocker reading his paper.He was great with kids and had so much fun with kids .I used to get mad at him because he always gave the babies (your dad&&Mike)the news paper to play with they would have printers ink all over them .He thought that s great fun.They were wonderful people . One more thing you never guessed how Bonnie felt about something she was not one to mince words much like your father!!! Ha! I love it. I wish I were more like my dad and Bonnie with telling it how it is. Thanks for sharing these memories. I wish I could’ve met them. It was nice talking to you today! Love you, Grandma. This is one of my favorite books, and I think part of it is the fact that it is more documentary than novel. I’m glad Steinbeck told the story of the sacrifices and heartaches of this group of people. Great perspective! It is like a documentary. Thanks for your great review here. Steinbeck does have a way of making those with the least the greatest heroes. “Sometimes a Great Notion” is another depressingly great book about the west. But my favorite tragic story of the west and the search for the American dream is “The Angle of Repose” by Wallace Stegner. Ok, now I MUST go read this book that I’ve always heard about and sort of knew, but have never read even though I’ve felt an affinity for. My parents made the trek as well – thirty years later than the time of the book, but their lives were so similar as they lived through the dust bowl, the depression and WWII. Thanks for your great review. Yes, you really must! I bet you would appreciate it and draw even more parallels to your parents’ journey. I got into Steinbeck when we lived for a short while in the bay area in California during a visit to Monterey. I love all his books, and it’s great to read your very personal review of one of my favorite books. I love Monterey. I spent some of my childhood in the Bay Area. I feel like I am visiting those places when I read his books. Pingback: Convince Me to Follow Your Blog | The Bookshelf of Emily J.
Pingback: Give Me Banned Books | The Bookshelf of Emily J.
Pingback: The First “Grown-Up” Book I Read | The Bookshelf of Emily J.
Pingback: Great Books for Thanksgiving | The Bookshelf of Emily J.
Amazing that you discovered a personal connection. I first read this at the same age, 13, and I remembered so much of it–pictures in my head and that it was “depressing,” However, as with you, upon rereading as an adult it meant ever so much more to me! As usual, a great review, Emily! Glad you liked it! I would say we shouldn’t be reading this so young. It really is a magnificent novel, but only if one can appreciate it. That’s funny we had the same experience!